Lao PM Bouasone Bouphavanh (L) receives his Vietnamese counterpart Nguyen Tan Dung at the National Assembly House’s Square in Vientiane. 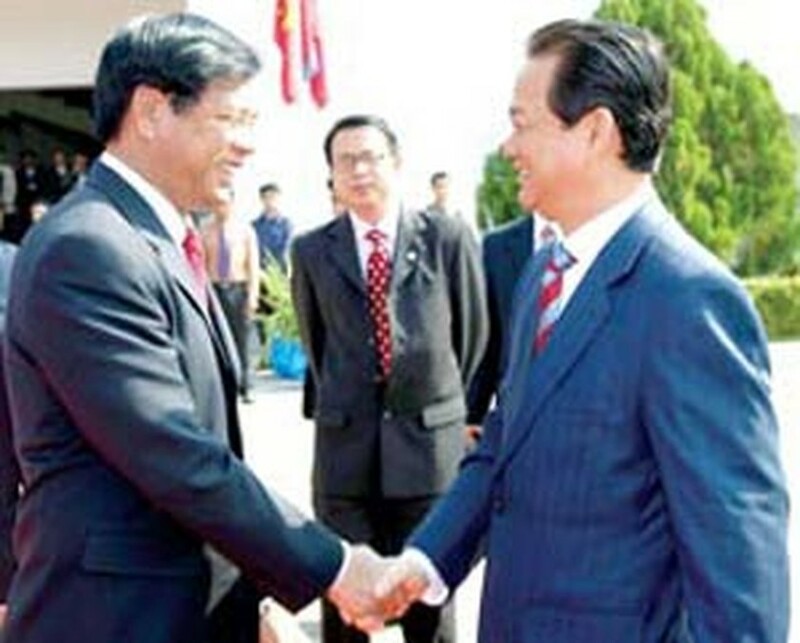 A high-ranking Vietnamese delegation led by Prime Minister Nguyen Tan Dung arrived in Vientiane yesterday, beginning an official visit to Laos at the invitation of his Lao counterpart Bouasone Bouphavanh. PM Dung and his entourage were warmly welcomed at the National Assembly House’s Square in Vientiane by Lao PM Bouasone Bouphavanh. Meeting with the leaders of Lao Party, State and National Assembly, PM Dung informed them of the results of his talks with his Lao counterpart, saying that Viet Nam is making active preparations for the annual meeting between the politburos of the two Parties early next year in Viet Nam and the 29th session of the inter-governmental committee for economic, cultural and scientific and technical cooperation between the two countries. He also said that he had instructed Vietnamese sectors, ministries and localities to make good preparations for the organization of the 45th anniversary of the establishment of diplomatic ties and the 30th anniversary of the signing of the Viet Nam-Laos Friendship Treaty in 2007 and will also ask them to conduct regular exchange visits to further strengthen bilateral cooperation. During the talks early yesterday, the two prime ministers expressed their happiness at the good economic, commercial and investment relations, agreeing that relations in culture and science and technology between the two countries have further developed and been effective thanks to the determination to build effective mechanisms and trade preferential policies in commerce. Viet Nam has by now had many investment projects totaling nearly US$500 million in Laos, focusing on electricity, forestry, mine ores, transportation and growing of industrial crops. During their talks, the two prime ministers stressed the need to enhance close and effective cooperation in implementing projects of the West-East Corridor, the Greater Mekong Sub-region, the Ayeyawady-Chao Phraya -Mekong Economic Cooperation Strategy (ACMECS) organization and Cambodia, Laos, Myanmar and Viet Nam (CLMV) cooperation in the context of current regional and international developments. They also confirmed their determination to cooperate with Cambodia to successfully build the Vietnam-Laos-Cambodia development triangle. Later the same day, they had witnessed the singing of the supplement to the energy agreement between the two governments, memorandums of understanding on the Sekaman 0 and 4 hydro-power development projects with a total capacity of 104 MW, iron and tin exploration, rubber planting and an agreement on preferential tariff. Mr. Dung and his entourage had also received a delegation of the Executive Board of the Laos-Viet Nam Friendship Association, met with the staff of the Vietnamese Embassy to Laos and laid wreaths at the unknown fallen combatants’ monument. In the afternoon, Prime Minister Nguyen Tan Dung paid a courtesy visit to General Secretary of the Lao People's Revolutionary Party and State President Chumaly Saynhason and met with National Assembly Chairman Thongsing Thammavong. In the evening, Lao PM Bouasone Bouphavanh held a banquet in honor of Mr. Dung and the Vietnamese delegation. Early this morning, the Vietnamese PM and Lao Vice President Boungnang Vorachit had attended the inauguration ceremony of the Friendship Bridge No 2 over the Mekong River that links the Lao province of Savanakhet and the Thai province of Muk Dahan. 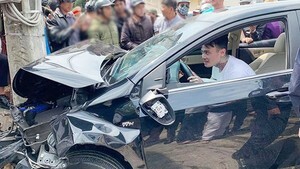 According to Mr. Dung, this is the combined effort by Laos and Thailand as well as effective assistance from the Japanese Government in building the second bridge spanning the Mekong River, which will greatly contribute to accelerating projects to connect the East-West corridor transport network. As scheduled, PM Dung and his delegation today will leave Vientiane for Bangkok for an official visit to Thailand at the invitation of Prime Minister Surayud Chulanont.